Please note: There will be our first parent/guardian meeting on Thursday, August 23rd. This is mandatory and will be to discuss the season and the overall S.F.P Cheerleading Program. This is for both the JV and Varsity teams. At this meeting, there will be a handouts for both you and your parents/guardians to read and sign which discusses what this season will be about and what is expected of you as an official S.F.P Cheerleader. Listed below is the try-out schedule/break down and skill-set requirements so you know exactly what to expect on August 16th and 20th. Thursday August 16th from 4 pm - 8 pm: We will be teaching the dance and cheer material needed for try-outs. Please arrive promptly so you can have the maximum amount of time needed to learn and master the dance, cheer and sidelines as well as having time to practice your stunts with your tryout group. There will be videos taken of all material (sidelines, jumps, cheers and dance) and forwarded via e-mail to all of you on August 16th. Use this as reference to review at home before tryouts OR to learn on your own if you have been away on vacation or if you will be away on vacation on August 16th. From 4:00 - 5:00 pm you will "free stunt" to show us your most difficult stunting skills. You will also have allotted time to show us your high level of difficulty with tumbling (if applicable). We will not officially score you during this time; however, we will be recording the skills performed with the highest level of difficulty, also taking execution into consideration. *IMPORTANT* During this 1 hour time frame, you can stunt with whichever group you choose, it does NOT have to be your try-out group. Veteran Cheerleaders from the 2017 - 2018 Season MUST incorporate stunts into the cheer. Newcomers DO NOT need to stunt and will NOT be penalized for this choice; however, if you have been coming to summer workshops and can do an elevator or a thigh stand, it is highly encouraged to do so. IMPORTANT: We will be calling sidelines at random from the list of sidelines attached. Please review these and know them ALL. Even though you are trying out as a group and synchronization is important, never forget that you are being judged as an individual! Your voice, charisma, and overall appeal during tryouts COUNTS TOWARDS YOUR SCORE! Make sure to smile throughout the entire performance and give it your very best shot. Always stay positive...if you mess up or forget a step, KEEP GOING! While summer workshops have not been considered mandatory, your attendance is highly encouraged! We have noticed a remarkable improvement in many athletes skills since the first workshop in July, keep up the good work! The REVISED August Schedule is attached. Please review and delete the August schedule that was previously sent out. If there are any questions please feel free to text or e-mail me. The tryout results will be e-mailed out to the individuals who make either the JV or Varsity Cheerleading team that same night (Monday, August 20th). 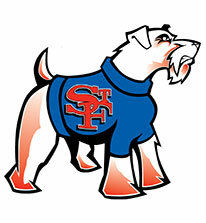 The results will be posted on the S.F.P Cheerleading pages the following day. Practice for both teams is MANDATORY the following night, Tuesday August 21st. 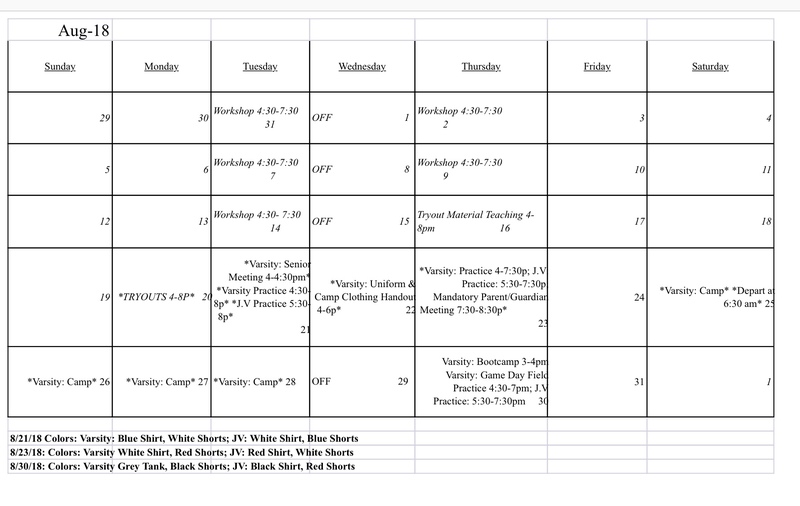 The schedule attached is the timing specifically for the Varsity Cheerleading team. JV's schedule will have similar timing and will be soon to follow. "SFP Cheerleading Summer Workshops officially begin on July 17th! The full schedule will be posted on July 10th, please check the website regularly for any updates. While these workshops are not considered mandatory, it is highly suggested that anyone intersted in making it onto the SFP Varsity or Junior Varsity Cheerleading team attend as many workshops as possible before tryouts on August 20th. Workshops will be held either on the west side of the gym or outdoors on the right side of school (on the grassy area next to the swingset) twice a week, 2-3 hours per workshop. Please wear: shorts or leggings, a loose fitting t-shirt, socks and sneakers. Please DO NOT wear: spanks or Nike Pros alone, sports bras alone, jean shorts, flip flops or slides. Please take out all jewlery before attending workshops, if you have a new piercing you cannot take out, you will be asked to sit and watch duirng stunting practice. Please DO NOT wear: fake/accrylic nails; if you have very long real nails or any type of fake nails on, you will not be permitted to stunt during workshops. Please make sure your hair is pulled back from your face and that you bring cold water with you to keep hydrated. If you have been dealing with a previous injury, please notify the coaches and bring a doctors note of clearance with you in order to participate. No cheerleading experience is necessary to attend or tryout!!! We just ask that you are willing to learn and participate and always try to maintain a positive and spirited attitude. If you have gymnastics experience you will be asked to show your highest level of tumbling at tryouts. It is suggested to stretch daily and to condition at home to build up your strength and stamina. Cheerleading is physically challangeing and if not conditioned properly can lead to strained muscles. Anyone who is interested in cheering or has further questions about the sport/team in general (grades 9-12 ONLY) please contact SFPVarsityCheer@gmail.com for more information. We look forward to seeing you on July 17th!" Please continue to check our page for additional information about our next competitions! Please notify us of any planned vacations ASAP.